Who Wants to Go to the Circus? August is Circus month here at KatersAcres! 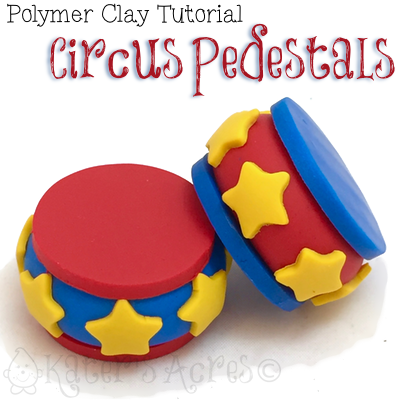 All throughout the month you’ll get adorable circus themed projects, including these polymer clay circus pedestals. Make sure you’re signed up for the newsletter so you don’t miss any of the fun. This simple pedestals are super fun and super easy. Follow these simple instructions to make your own instantly adorable pedestals. Choose three colors of clay. I have used pomegranate, blue pearl, and cadmium yellow. Choose ONE color and roll it into a ball. Use an acrylic plate to compress the ball, making the top & bottoms flat. Remove the smashed ball from the acrylic. Roll a different color of clay on the thickest setting of your pasta machine. Use a cutter just smaller than the size of the ball and cut 2 rounds from that color. Place one round on the top and one round on the bottom of your smashed ball. Now run a 3rd color through your pasta machine on the 4th smallest setting. Cut out 7-13 stars (depending on the size of your smashed ball) using a star shaped cutter. Place the stars evenly all around the round part of the ball. Try to line all the stars up so their points match height and location. Bake in a dedicated polymer clay oven according to your brand’s directions. Get the rest of the circus here.